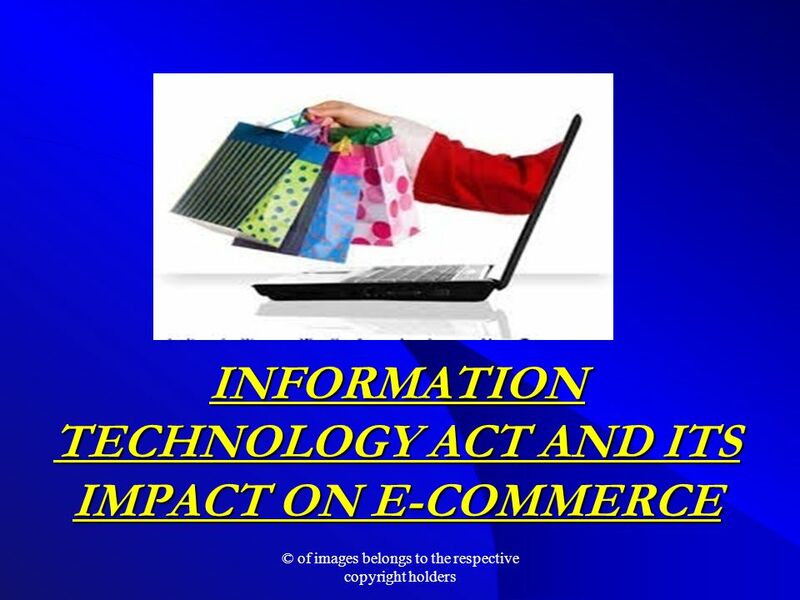 INFORMATION TECHNOLOGY ACT AND ITS IMPACT ON E-COMMERCE © of images belongs to the respective copyright holders. 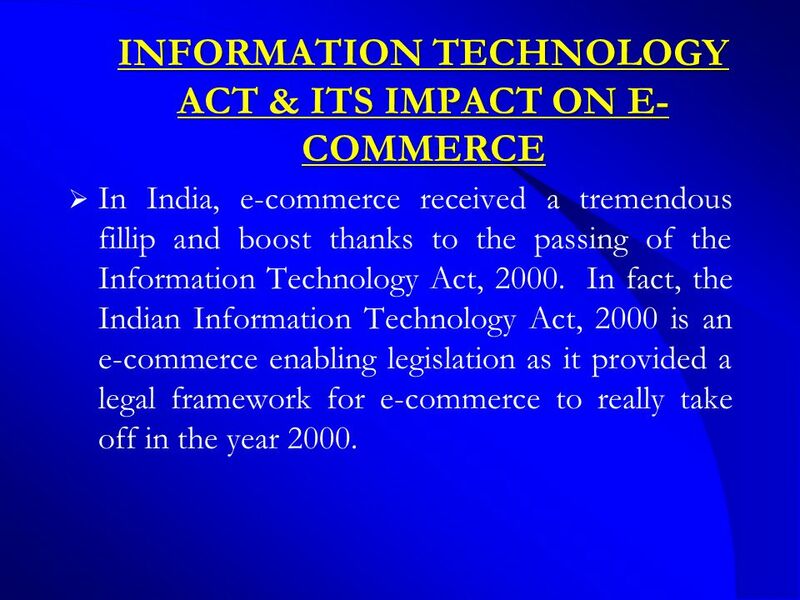 3 INFORMATION TECHNOLOGY ACT & ITS IMPACT ON E- COMMERCE  In India, e-commerce received a tremendous fillip and boost thanks to the passing of the Information Technology Act, 2000. 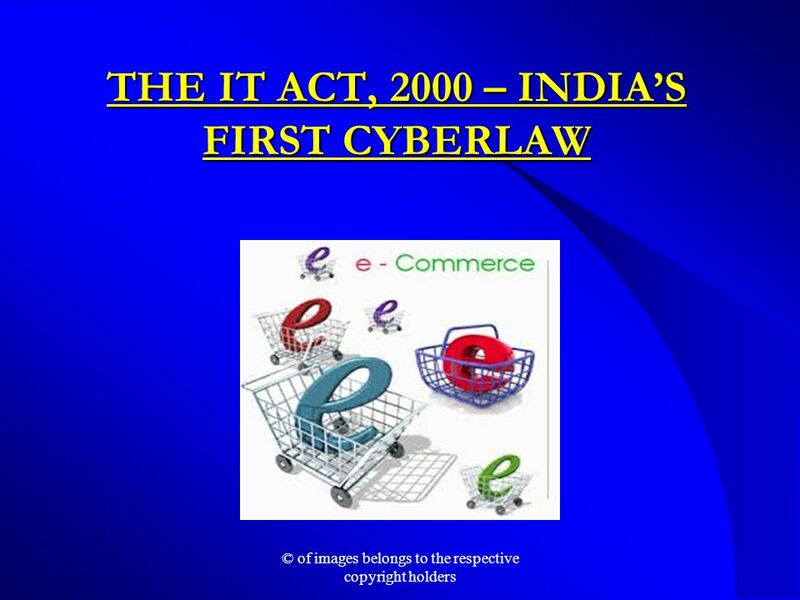 In fact, the Indian Information Technology Act, 2000 is an e-commerce enabling legislation as it provided a legal framework for e-commerce to really take off in the year 2000. 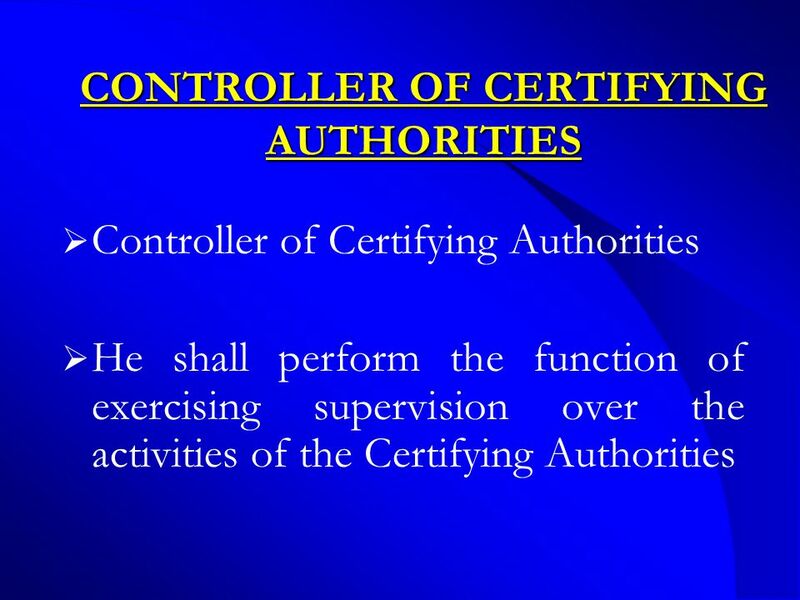 13 CONTROLLER OF CERTIFYING AUTHORITIES (Contd.) 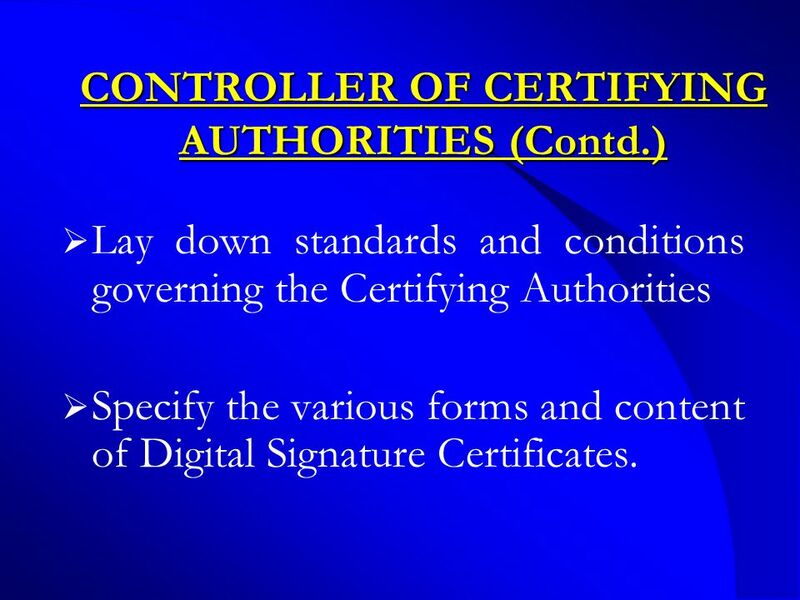  Lay down standards and conditions governing the Certifying Authorities  Specify the various forms and content of Digital Signature Certificates. 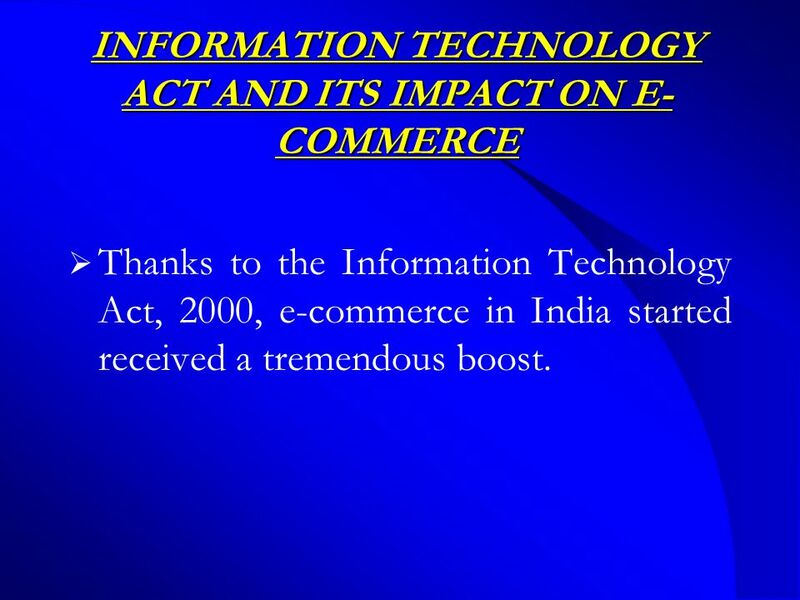 17 INFORMATION TECHNOLOGY ACT AND ITS IMPACT ON E- COMMERCE  Thanks to the Information Technology Act, 2000, e-commerce in India started received a tremendous boost. 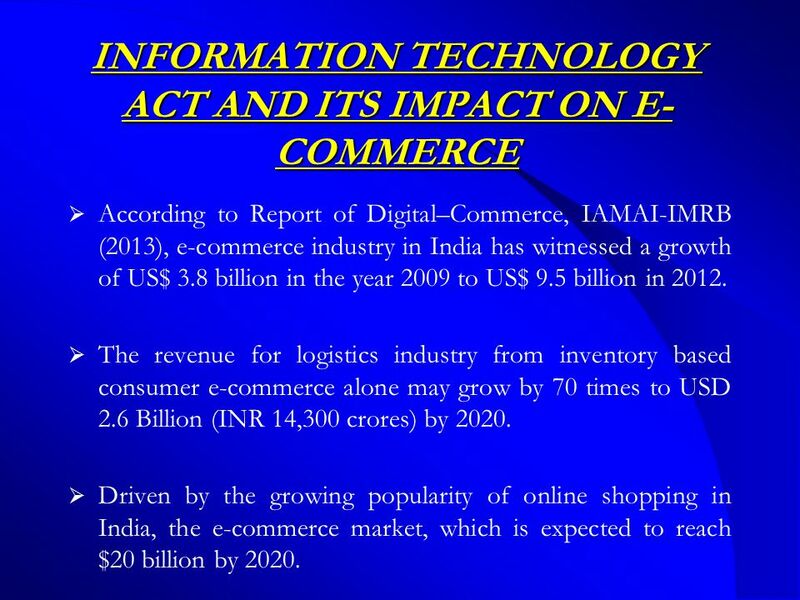 18 INFORMATION TECHNOLOGY ACT AND ITS IMPACT ON E- COMMERCE  According to Report of Digital–Commerce, IAMAI-IMRB (2013), e-commerce industry in India has witnessed a growth of US$ 3.8 billion in the year 2009 to US$ 9.5 billion in 2012.  The revenue for logistics industry from inventory based consumer e-commerce alone may grow by 70 times to USD 2.6 Billion (INR 14,300 crores) by 2020.  Driven by the growing popularity of online shopping in India, the e-commerce market, which is expected to reach $20 billion by 2020. 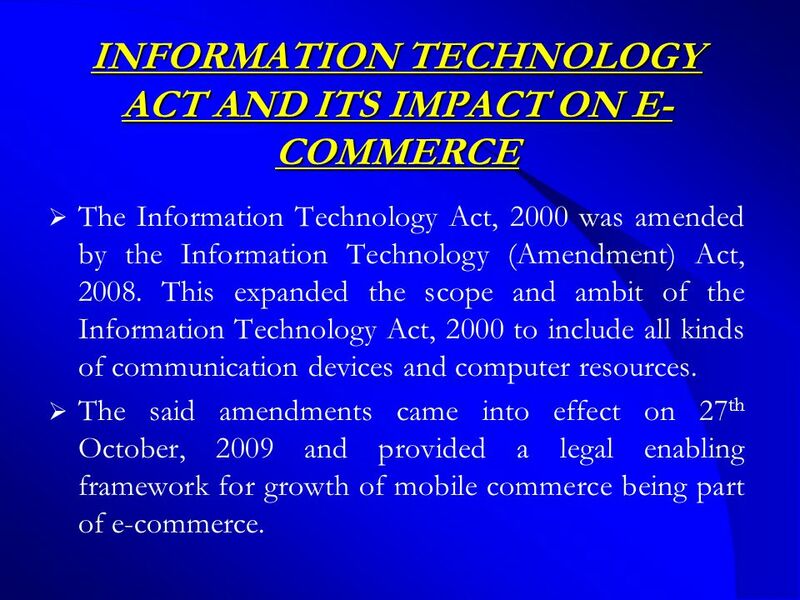 19 INFORMATION TECHNOLOGY ACT AND ITS IMPACT ON E- COMMERCE  The Information Technology Act, 2000 has also provided the solid basis and foundation for further growth of e-commerce and m- commerce. 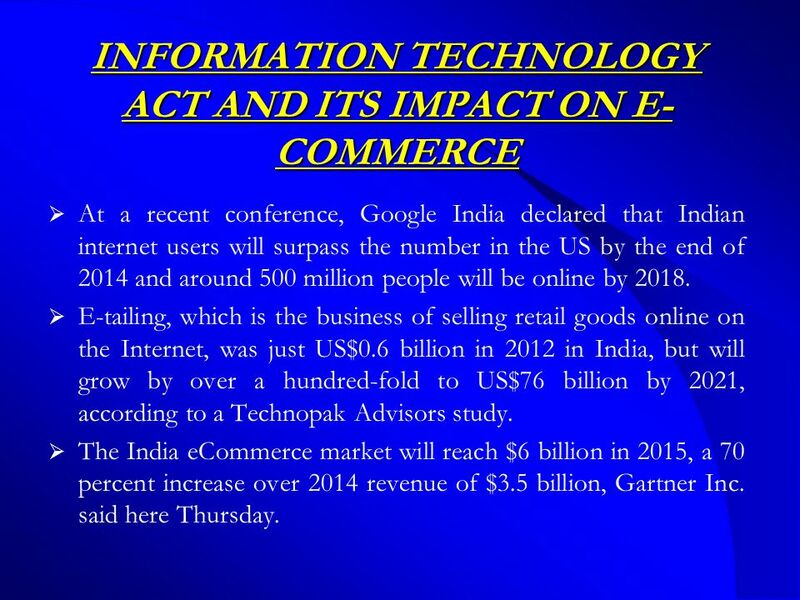 20 INFORMATION TECHNOLOGY ACT AND ITS IMPACT ON E- COMMERCE  At a recent conference, Google India declared that Indian internet users will surpass the number in the US by the end of 2014 and around 500 million people will be online by 2018.  E-tailing, which is the business of selling retail goods online on the Internet, was just US$0.6 billion in 2012 in India, but will grow by over a hundred-fold to US$76 billion by 2021, according to a Technopak Advisors study.  The India eCommerce market will reach $6 billion in 2015, a 70 percent increase over 2014 revenue of $3.5 billion, Gartner Inc. said here Thursday. 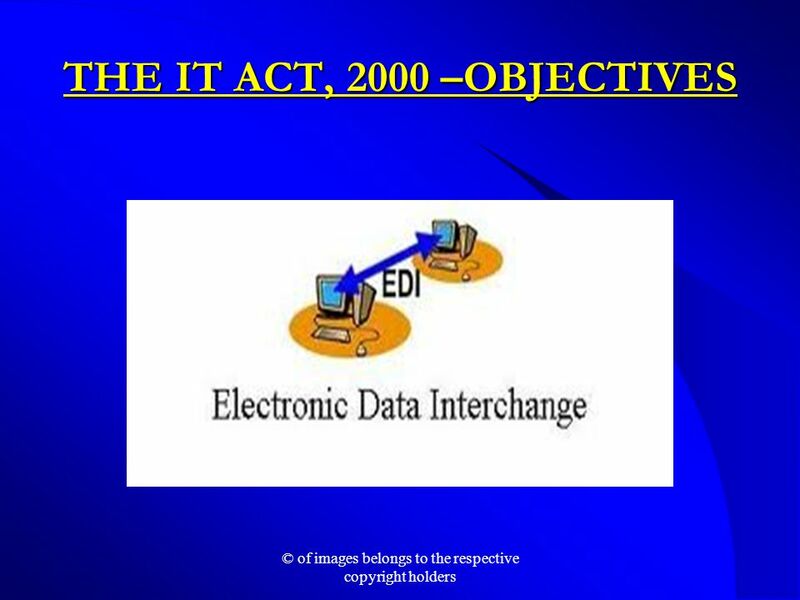 21 INFORMATION TECHNOLOGY ACT AND ITS IMPACT ON E- COMMERCE  The Information Technology Act, 2000 was amended by the Information Technology (Amendment) Act, 2008. 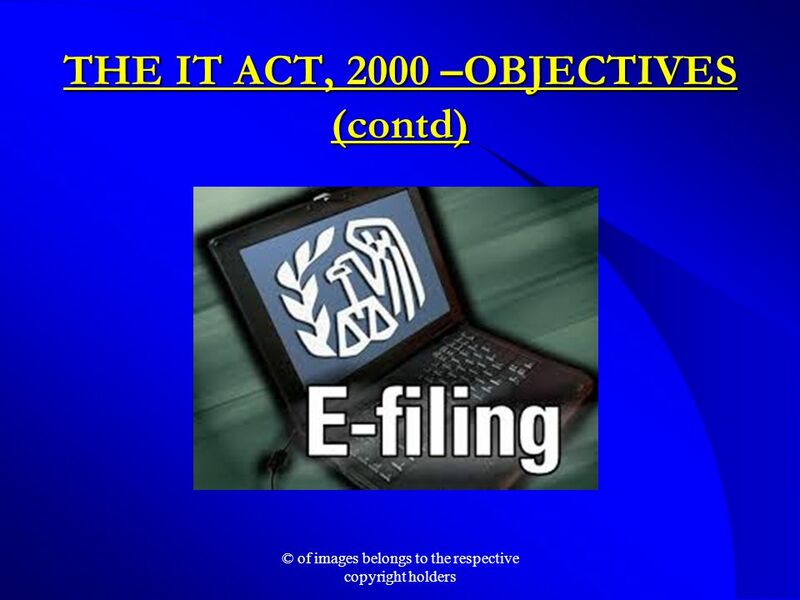 This expanded the scope and ambit of the Information Technology Act, 2000 to include all kinds of communication devices and computer resources.  The said amendments came into effect on 27 th October, 2009 and provided a legal enabling framework for growth of mobile commerce being part of e-commerce. 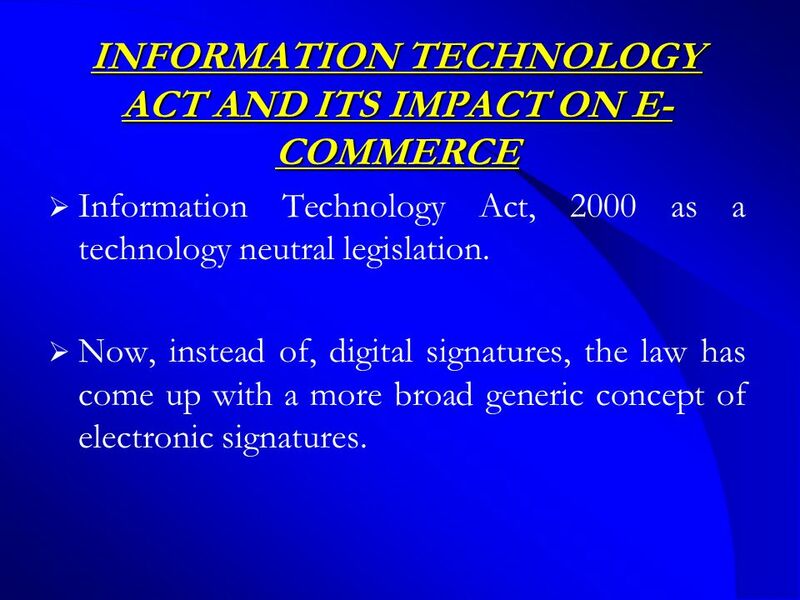 22 INFORMATION TECHNOLOGY ACT AND ITS IMPACT ON E- COMMERCE  Information Technology Act, 2000 as a technology neutral legislation. 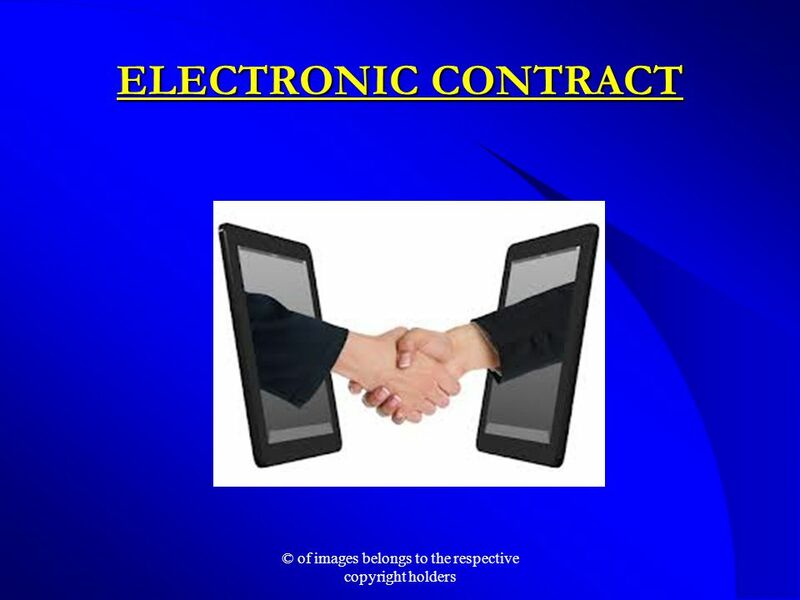  Now, instead of, digital signatures, the law has come up with a more broad generic concept of electronic signatures. 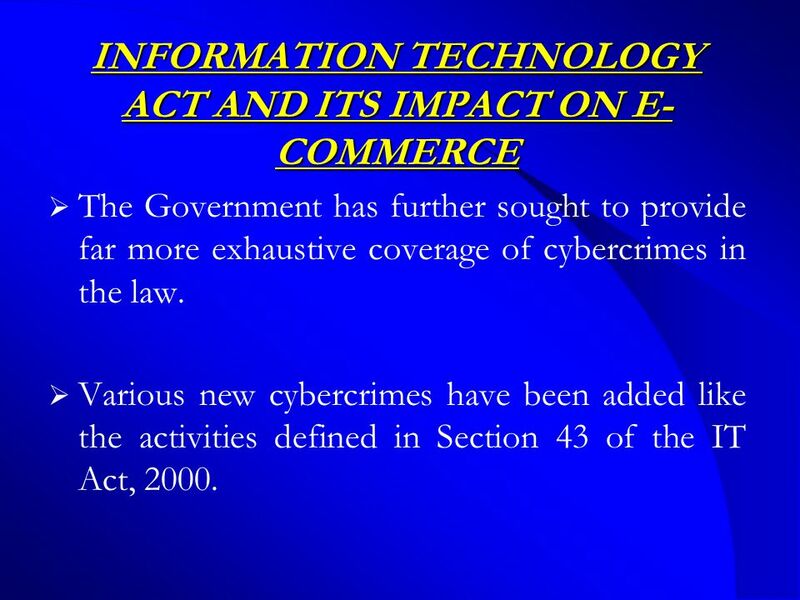 23 INFORMATION TECHNOLOGY ACT AND ITS IMPACT ON E- COMMERCE  The Government has further sought to provide far more exhaustive coverage of cybercrimes in the law. 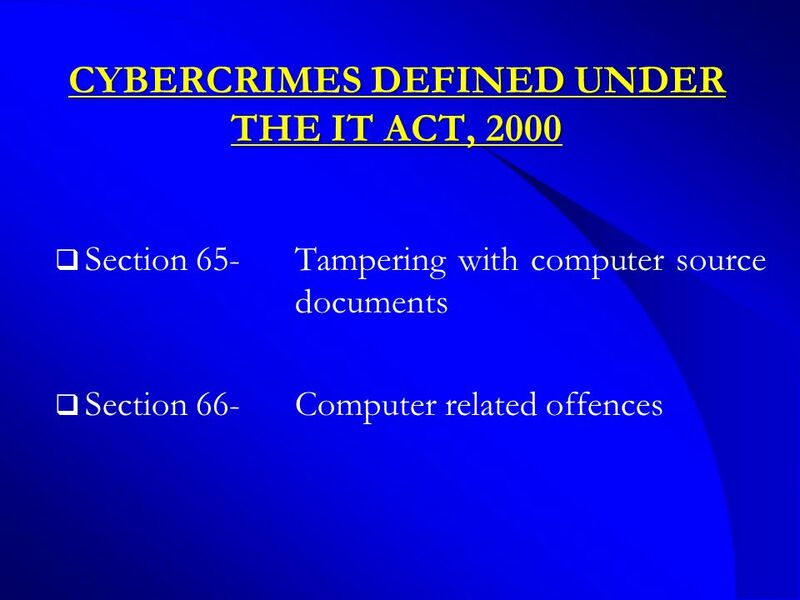  Various new cybercrimes have been added like the activities defined in Section 43 of the IT Act, 2000. 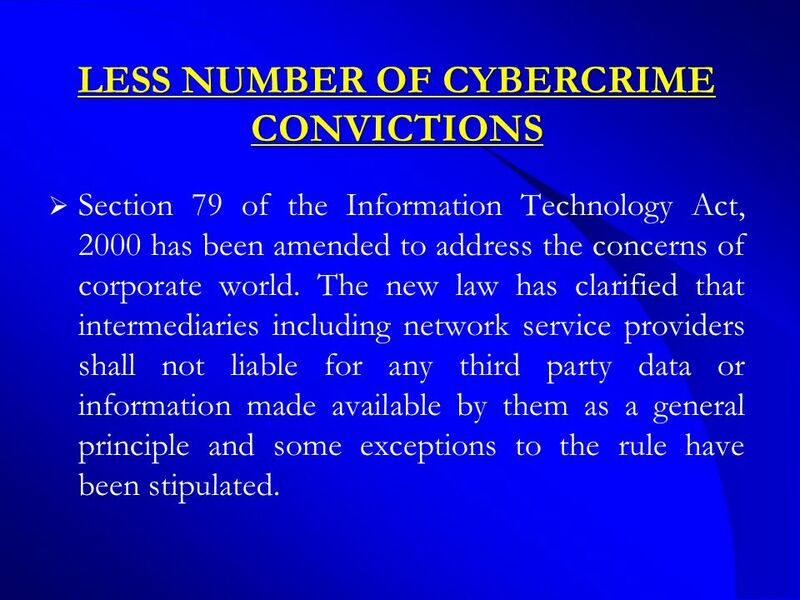 24 LESS NUMBER OF CYBERCRIME CONVICTIONS  Section 79 of the Information Technology Act, 2000 has been amended to address the concerns of corporate world. The new law has clarified that intermediaries including network service providers shall not liable for any third party data or information made available by them as a general principle and some exceptions to the rule have been stipulated. 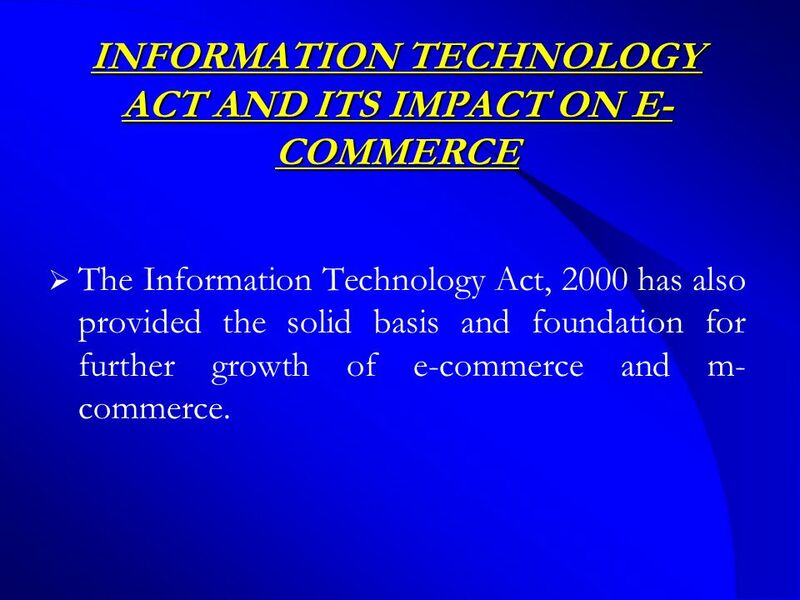 25 INFORMATION TECHNOLOGY ACT AND ITS IMPACT ON E- COMMERCE  Thanks to these amendments, the Information Technology Act, 2000 has become an enabling framework for growth of e-commerce. 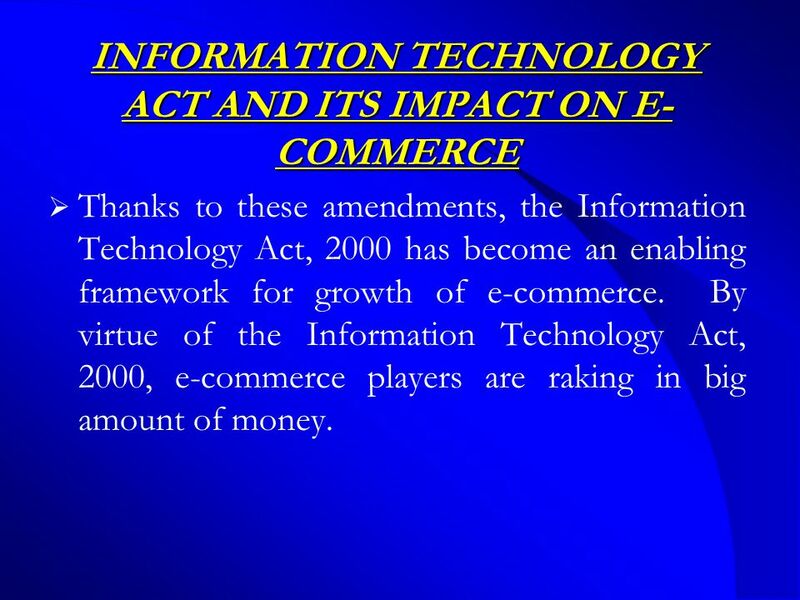 By virtue of the Information Technology Act, 2000, e-commerce players are raking in big amount of money. 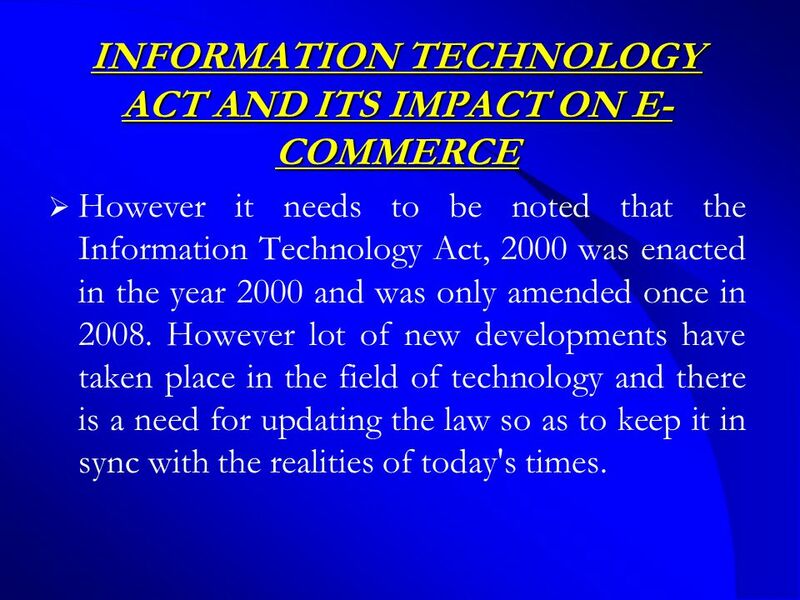 26 INFORMATION TECHNOLOGY ACT AND ITS IMPACT ON E- COMMERCE  However it needs to be noted that the Information Technology Act, 2000 was enacted in the year 2000 and was only amended once in 2008. 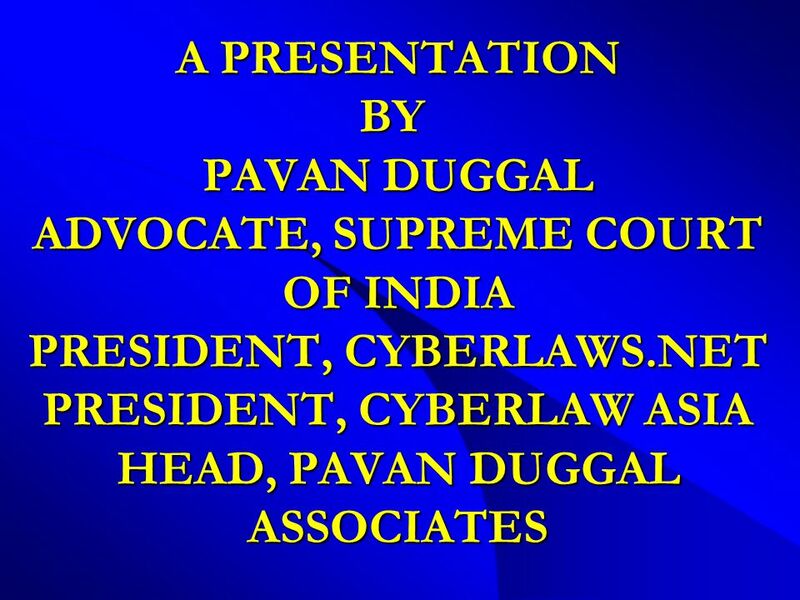 However lot of new developments have taken place in the field of technology and there is a need for updating the law so as to keep it in sync with the realities of today's times. 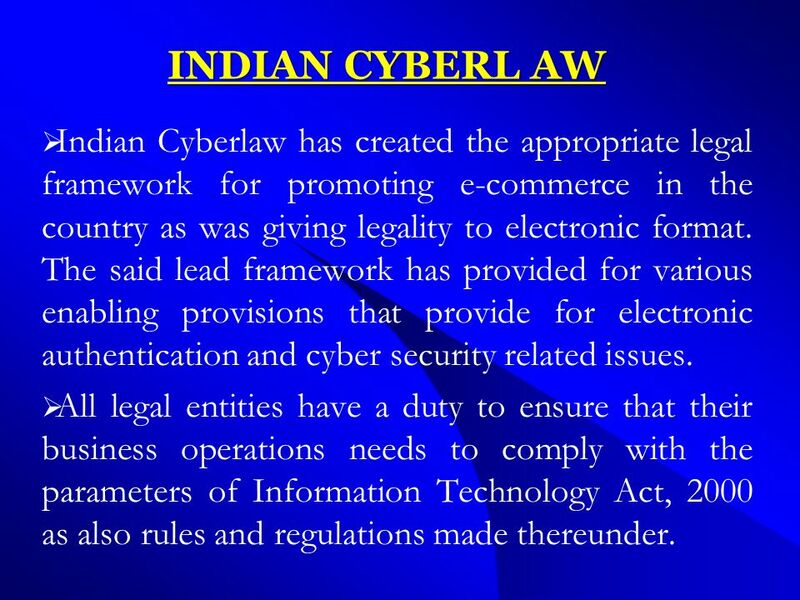 28 INDIAN CYBERL AW  Indian Cyberlaw has created the appropriate legal framework for promoting e-commerce in the country as was giving legality to electronic format. The said lead framework has provided for various enabling provisions that provide for electronic authentication and cyber security related issues. 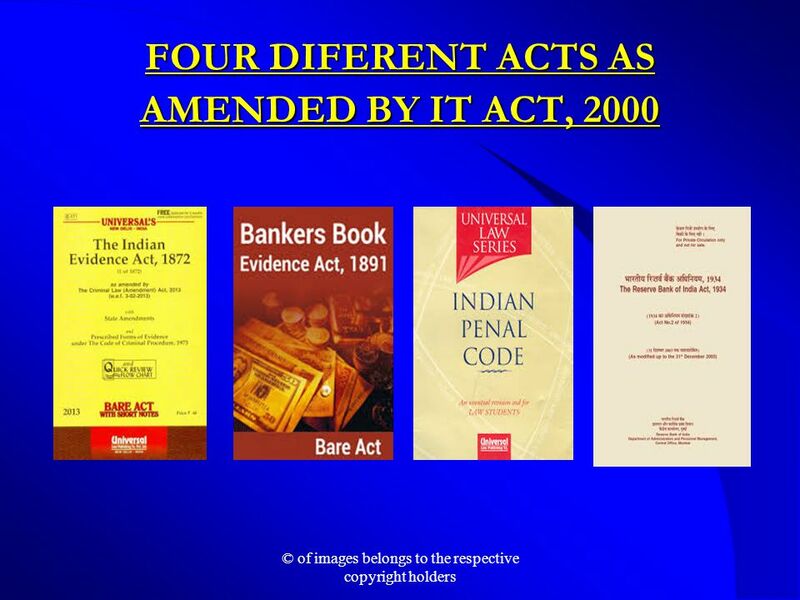  All legal entities have a duty to ensure that their business operations needs to comply with the parameters of Information Technology Act, 2000 as also rules and regulations made thereunder. 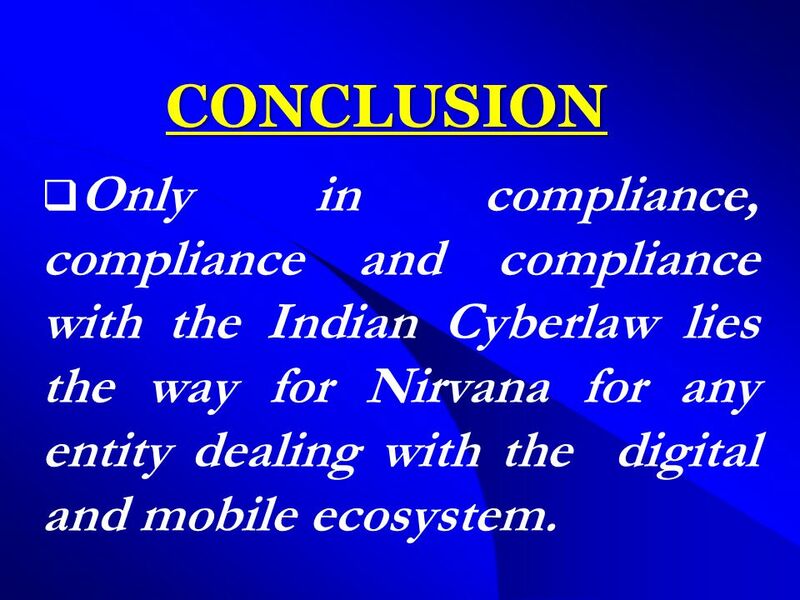 29 CONCLUSION  Only in compliance, compliance and compliance with the Indian Cyberlaw lies the way for Nirvana for any entity dealing with the digital and mobile ecosystem. 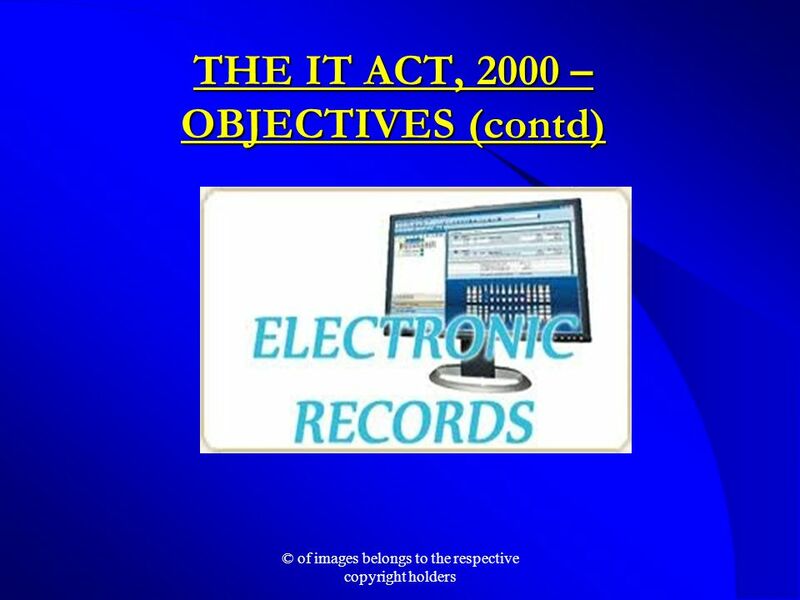 Download ppt "INFORMATION TECHNOLOGY ACT AND ITS IMPACT ON E-COMMERCE © of images belongs to the respective copyright holders." ITU E-Commerce Conference for the Arab Region - May 2001 A Digital Signature Act for Egypt: Understanding the Challenges! Dr. Sherif Hashem Head, Electronic. International forum on eNotarization and eApostilles The impact of e-technology on notarial acts: legal and technical possibilities and limits -relevance. Conference on Accelerating Global Commerce Through Technology and Policy Elliot E. Maxwell September 20, 2002 The E-Commerce Policy Landscape. Tyntec Research: Brazilian and Russian Social Media Users Are Concerned About Identity Theft – UK and US Counterparts Worry Most About Lack of Information. Business Communications Done By: Rainy Sturgeon and Josh Cohen. Indian gas regulatory framework: Industry issues. 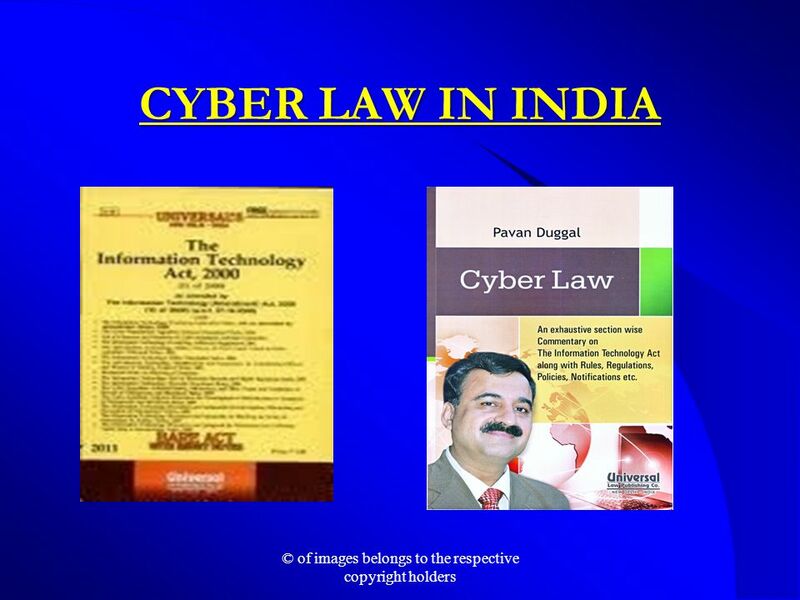 INDIAN CYBERLAW- SOME PERSPECTIVES INDIAN CYBERLAW- SOME PERSPECTIVES. I NFORMATION T ECHNOLOGY A CT B ACKGROUND 1. 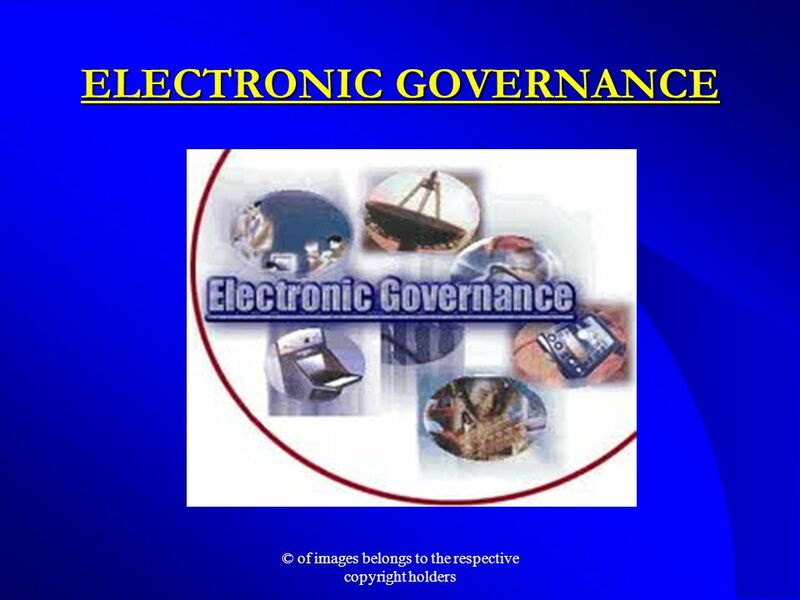 Drew inspiration from Model Law on Electronic Commerce adopted by the United Nations Commission of. 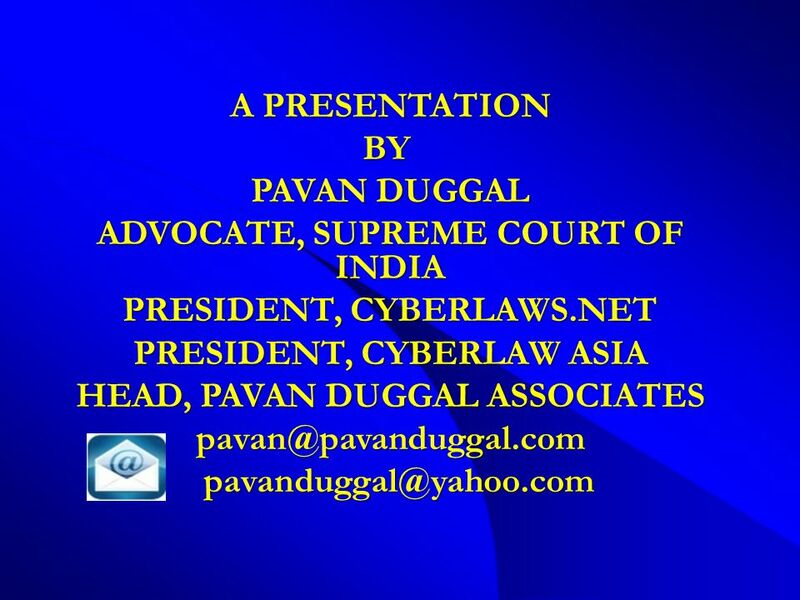 EXAMINING CYBER/COMPUTER LAW BUSINESS LAW. 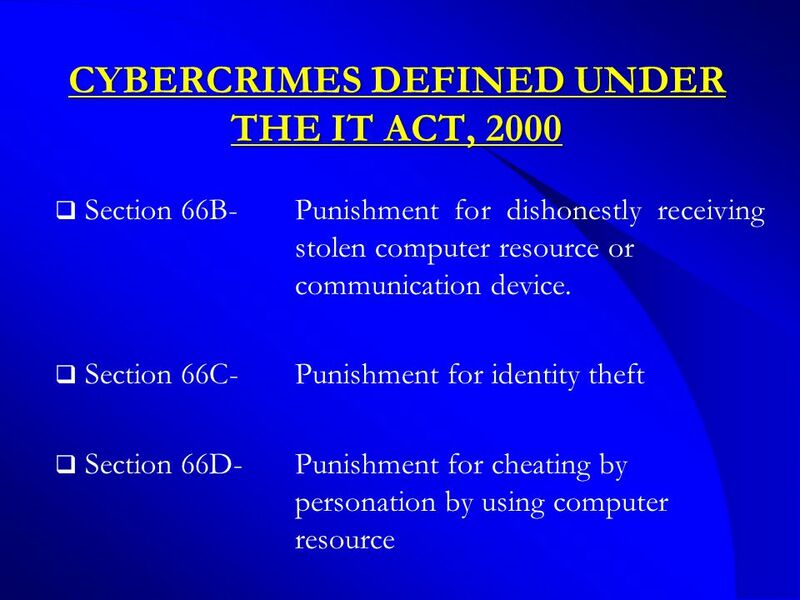 EXPLAIN CYBER LAW AND THE VARIOUS TYPES OF CYBER CRIMES. Consumers Online: Privacy, Security and Identity Professor Margaret Jackson and Marita Shelly Presentation to the RMIT Financial Literacy, Banking & Identity. 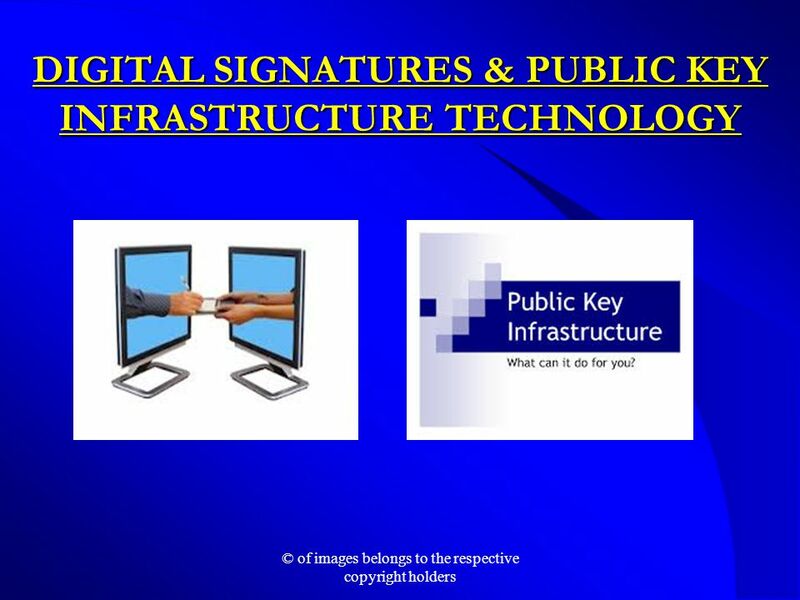 E-Procurement: Digital Signatures and Role of Certifying Authorities Jagdeep S. Kochar CEO, (n)Code Solutions.